ITS Campus, ITS News – The chem-e-car team of Sepuluh Nopember Institute of Technology (ITS) Surabaya, Spektronics, once again won an international award. Namely the Best Video award and the Most Outstanding AIChE Student Chapter at American Institute of Chemical Engineers (AIChE) Competition 2018 in Pittsburgh, Pennsylvania, USA, on October 26th-28th 2018. ITS Spektronics Team managed to maintain the Best Video award the team had won in the previous AIChE 2017 event. This accomplishment is not without a lot of hard work. The Spektronics team had painstakingly prepared a video that can reflect four important factors. These factors are related to a team factor such as the team’s design, experimentation, compactness, and technical preparation for each chem-e-car race. The Spektronics team is keen to pay attention to every detail that is displayed in the video because the judges’ appraisal is based on these four factors. “So, in our video, we make sure to include these four factors and have them to also reflect the Spektronics team,” explained Head of ITS Chemical Engineering Department, Juwari, S.T, M.Eng, Ph.D., when contacted via phone message, Monday night (10/29). 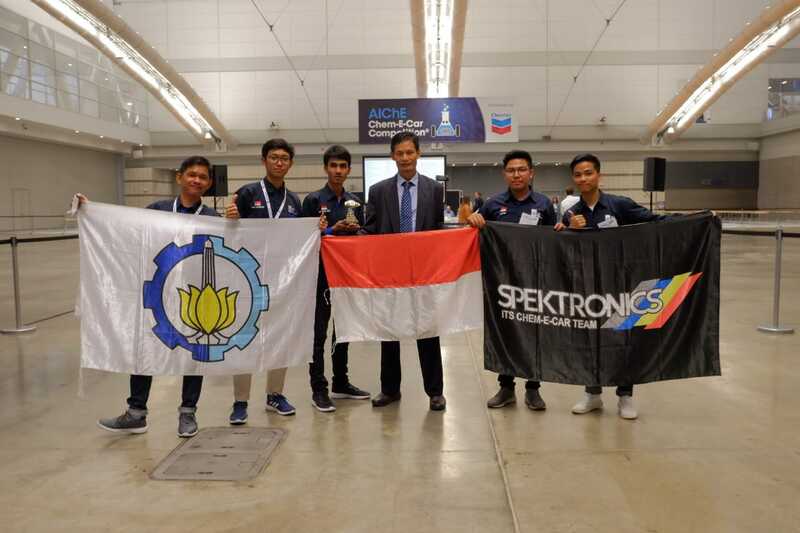 ITS Spektronics Team that fought for the competition in the USA consisted of Miftahul Hadi, Afif Al Arif, Ronald Pakpahan, Widi Citra L, Rifqy Furtiansyah, and Auzan Widhatama. The six students were accompanied directly by Juwari as the team’s mentor. On the same occasion, the Spektronics team also won the Most Outstanding AIChE Student Chapter award at the AIChE Annual Conference 2018. This award was given directly by the President of AIChE, Christine Seymour, to Juwari as the advisory representative of the Spektronics Team. 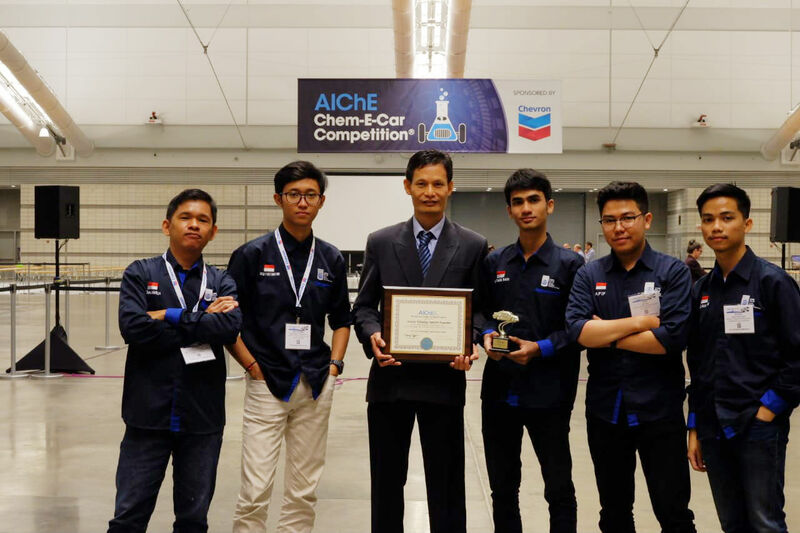 “I represent the other advisory colleagues as well, such as Fadlilatul Taufany, Ichan Nugraha, and Putu Rama as President of ITS AIChE Student Chapter,” Juwari said. The award, he continued, was given to active student chapters with consistent participation, enthusiasm, and program quality. In addition, the student chapter needs to have professionalism and roles in universities and communities. “Alhamdulillah, we received this award thanks to the hard work of all colleagues, I hope this victory will be a blessing and an encouragement to the team,” he said. Meanwhile, for this prestigious race competition, ITS Spektronics Team this time was only able to rank 14 out of 40 team finalists. The team finalists came from China, Qatar, Canada, Saudi Arabia, Korea, and others with the USA as the host. The failure to defend the first place last year was due to several obstacles during the competition. Among them are equipment boxes that were destroyed when they arrived in Pittsburgh, USA and the loss of several tools. When they checked again, the primary containment and filter paper are lost. “Finally, we (the Spektronics team) went around the shop to find a replacement, the primary containment was replaced, but for the filter paper we could not find any replacement,” said Afif Al Arif, a member of ITS Spectronics team who was contacted online. ITS Spektronics Team, with AIChE 2018 judge panelist.